A multivitamin safe for the whole family in a easy to mix powder form. 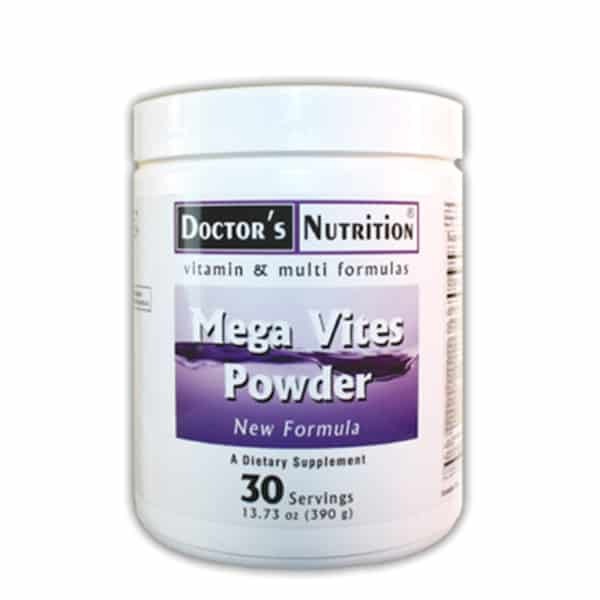 • Mega Vites Powder is free of copper and iron, which make it easy to incorporate into the diet of highly sensitive individuals. • Mega Vites Powder focuses on completeness, bioavailability, balance and potency and is based on input from industry leaders. • Calcium, Magnesium, Phosphorus, Vitamin D3 and Boron support growing and mature bones. * Magnesium assists with calcium and potassium uptake while boron is needed for the metabolism of calcium, phosphorus and magnesium. Along with promoting strong bones, calcium helps to protect bones and teeth from lead by inhibiting its absorption. * When calcium is deficient, lead can be absorbed and deposited in the teeth and bones. Warning: Do not take this product if you are taking anticoagulant/anti platelet drugs such as Warfarin (Coumadin). If you are pregnant or nursing, consult your healthcare practitioner before taking this product. Other ingredients: xylitol, orange juice powder, citric acid, xanthan gum, natural lemon-lime flavor. • Suggested Use: As a dietary supplement, mix amount indicated below, into 6-8 oz of cold water or juice, or as directed by your healthcare practitioner. Children 4-12: 1/2 scoop daily, with a meal. Over 12: 1 scoop, daily with a meal.